These eco-friendly K2 inline skates, both Maia women's and Etu men's (on sale for $189.95) not only green, but pretty damn awesome-looking. 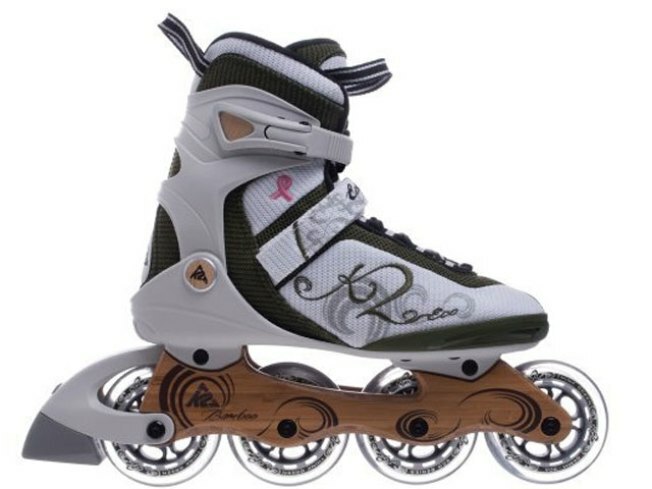 The skates are made with as many eco-friendly materials as possible, which is more than one can say for the mountains of plastic and metal skates out there. The skates' bamboo frames are as strong as aluminum but environmentally sustainable. K2's Softboot design uses recycled polyethylen-terephthalat, which kinda sounds like a toxic chemical, but believe it or not is also sustainable. We've never been afraid to share our love for faux-vintage electronics. The Crosley Songwriter CD Recorder Turntable ($399) will help you digitize your vinyl and cassettes, even though if you're really one of those folks clinging to vinyl, you're probably so indie you'd never dream of owning an iPod. Or old. You could be really really old. Either way though, we do recommend this good-lookin' doohickey, which supports MP3 and WAV file playback. The built-in turntable plays 33-1/3, 45 and 78 rpm records and is compatible with CD-Rs and CD-RWs. If you're still toting around a grungy Hello Kitty wallet, we want to let you know something. You're not being edgy, you're not being ironic, and we do notice that coffee stain on the edge. Creep slightly closer to grownup-dom with a MARC by Marc Jacobs zip billfold in electric blue crocodile-embossed patent leather. It's on sale at Cusp for a mere $66 (down from $148), and while there are Cusp stores in Georgetown (3030 M St. N.W.) and Tysons, only the online shop is guaranteed at this point, 'cause that discount is just too good. Use code CSPTREND for free shipping.